Enabavi, a village of 52 families, is abuzz. It is hosting farmers from the nearby Kallem village who have come here for tips on profitable agriculture. Those who missed the excitement of the Green Revolution in the 1960s can get a glimpse of it here--there is the air of collective achievement, and farmers from neighbouring villages are here because they do not want to lose out. There is one big difference from the 1960s, though farmers are teaching and learning ways of increasing productivity without applying synthetic chemicals. Agriculture is a happy story in Enabavi. A jith Kumar, an Air India executive posted in Hyderabad, does not linger over lunch on weekdays. 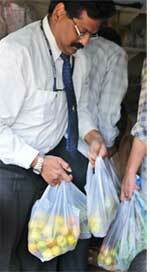 Instead, he rushes to the agricultural cooperative store next to his office to buy vegetables. These vegetables are farm fresh and free of pesticides. Kumar's wife calls him to make sure he leaves office in time. "I don't mind the extra effort. These vegetables taste much better," Kumar said as he stood waiting in the queue outside the Hyderabad Agriculture Cooperative Association (haca) store. Fresh stocks brought in every afternoon fly off the shelves within two hours. That is why Kumar and other professionals like him as well as housewives living in nearby residential areas rush to the store as soon as the vegetables arrive. The customers are happy to pay a small premium. "I don't mind paying the extra two rupees as these vegetables taste better," said Altaz Naseer Muniza, another regular at the store. Non pesticidal management does away with the use of any synthetic pesticide in agriculture. Instead, various homemade concoctions made from neem, garlic, chillies, plant and herb extracts, cow dung and cow urine are used along with pheromone traps that lure pests and other traditional methods of pest control. How does NPM save costs? Over a period of time pesticides have proved to be ineffective in controlling pests. Use of natural pest control methods cuts cost of cultivation drastically. Farmers can save up to Rs 5,000 per acre. The crop yields without pesticides have been the same and fetch better prices. Thus farmers earn more by investing less. How is it different from organic farming? NPM is the first step towards organic farming. It does away with the use of chemical pesticides while organic farming does away the use of all synthetic chemicals, including fertilizers. Organic farming relies on use of green manure, compost and crop rotation or intercropping to enhance soil fertility. It also allows friendly weeds and insects to grow. The term NPM was coined in1998 by M S Chari, scientific adviser to Centre for World Solidarity, a non-profit that helped to solve the problem of the red hairy caterpillar ruining the red gram crop in the Telangana region. After a series of tests, they concluded pesticides were not required in cultivation. The Society for Elimination of Rural Poverty (SERP), created under the state's rural development ministry, took the programme forward with World Bank and Central aid. Rural credit was given to women self help groups. This scheme is was called Indira Kranthi Patham. NPM was included in this scheme in 2005. It covers 340,000 farmers in over 3,000 villages. Kruppakar Reddy, the store in-charge, said the demand for vegetables grown through non-pesticidal management, called npm vegetables, is on a high. He said only one farmer is supplying npm vegetables as of now. "We plan to provide him with exclusive space in the building. Refrigerated storage space will be given to other farmers as well," Reddy said. The farmer who supplies the npm vegetables to the cooperative store comes from Manchal village, 50 km away from Hyderabad. Srinivas Reddy, the 25-year-old farmer, started supplying pesticide-free tomatoes, okra, brinjals, gooseberries, chillies and leafy vegetables to the store five months ago. "To meet the high demand other farmers send their produce through me. Many of them are switching to npm in my village," he said. His increasing profits reflect the demand for the vegetables. From the initial Rs 1,500 a month, his profits have gone up three times. Other towns also sell npm vegetables in farmers' markets. 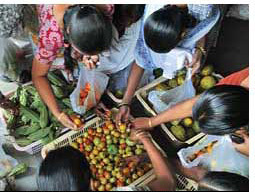 One such market in Kadapa district's Chinta Komadini mandal has three stalls where farmers sell npm vegetables, paddy, chilli powder and other produce for a premium. "The farmers bring their stocks at seven in the morning thrice a week and everything gets sold in an hour," said Venkat Brahman, the Kadapa district project manager for the npm programme. Teachers, small businessmen and government officials are among the clients. Like Srinivas, other farmers are discovering that growing pesticide-free vegetables, grains and pulses is profitable. They have been able to cut the cost of cultivation by doing away with chemical pesticides--the costliest input in agriculture here. The yield remains more or less the same and the net profits go up. Krishna Reddy, a 62-year-old retired teacher of Edirapalle village in Mahabubnagar district, grows millets, grams, groundnut, castor, jowar, bajra and vegetables in a small plot in front of his house. He grows marigolds and sunflowers on the borders to trap pests and protect crops. What changes have you seen in NPM since 2005? It has expanded beyond our expectations. We started with just 400 acres (160.34 ha). This year our outreach will be 14 lakh acres (561,220 ha). What is remarkable is that the programme is completely owned by the farmers and women's self help groups. Can decline in suicide deaths be attributed to NPM success? Suicides are a complex phenomenon. What we can say is there is a lot of distress in agriculture. With farmers following npm, we have seen a significant reduction in distress levels. They have been able to reduce costs, withstand price cuts better and improve their health. What are you looking at next--exports or farmer sustainability? For commercial crops like chillies, cotton and vegetables, it is important to look at bigger markets. But we recommend that farmers move away from monocropping because commercial crops are susceptible to price fluctuations. We would like them to reduce risks and then explore the bigger markets. All options are open; the farmers will decide. Critics of NPM say it will create a food security problem. What is your take? It is not true. On the contrary, crop production will go up. Intercropping yields diverse cereals, adequate fodder and fuelwood. There are crops that mature at different times of the year, so in a way we are staggering the flow of income for the farmer. Small and marginal farmers will become producers of grains. There will be greater food security once NPM is applied to fallow land. His cost of cultivation is Rs 600 (cost of soil preparation and seeds). And his yield is worth Rs 3,000. He sells a small part of his produce in the market. In Manchal mandal, a women's self help group has cultivated a field with 29 varieties of vegetables and pulses. The state government's Society for Elimination of Rural Poverty (serp) and the horticulture department have helped to set up these vegetable farm models in a number of villages. Farmers are provided seed kits at 90 per cent subsidy. Several earn profits up to Rs 50,000 a year. 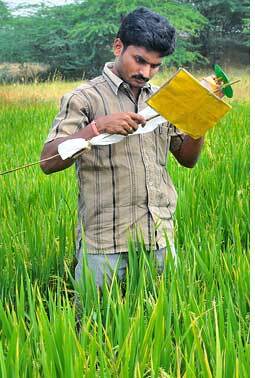 Farmers have been able to reduce the cost of cultivation by Rs 2,500 to Rs 5,000 per acre (0.4 hectare) by doing away with pesticides. The trend of npm farming has grown steadily since 2005 (see 'Out of the trap', Down To Earth, May 31, 2006). npm started as a campaign of non-profits to get farmers to give up pesticides to earn better. The state rural development ministry took it forward through serp which is currently implementing npm in 3,000 villages across 18 of the 23 districts. With farmers saying no to pesticides, dealers of pesticides and fertilizers have had to shut shop or switch to alternate vocations. 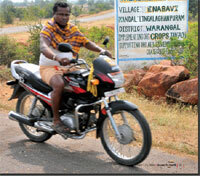 Twenty seven-year-old Krishna Reddy of Todalapalle village in Kadapa district is one of them. From a fertilizer and pesticide dealer, he switched to products made from neem and other bio-formulations used to control pests and improve soil fertility. Krishna now sells neem powder, seeds and pheromone traps (for luring and trapping pests) among other things to the villagers. "Eighty per cent of the farmers in my village had stopped using chemicals and asked me to keep bio-products. Though my earnings from the shop have gone down from Rs 10,000 to Rs 8,000, I am able to cover up the deficit by selling my own farm produce grown without pesticides," Krishna said. npm has made entrepreneurs out of some women. 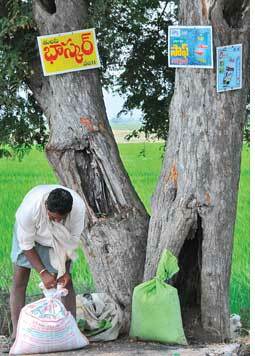 There are those who sell bio-products used for npm farming. K Keija, a 30-year-old mother of two, earns up to Rs 3,000 profit by selling bio formulations from the shop she set up in Kondapatturu, Guntur district, two years ago. She sells ghanajeevastra, neemastra and brahmastra, which she makes by sourcing raw materials such as cow dung, cow urine, milk, curd, chillies, garlic, neem. She can also afford the treatment for her daughter who has polio. "My husband works as a farm labourer and earns very little. I could not take our daughter to the government hospital in Guntur for treatment earlier, but things have changed," Keija said. Khairunnisa Begum of Vattam village in Mahabubnagar district is another woman entrepreneur. She set up her shop to promote npm farming in 2007. "I give my products free to poor and needy farmers," said the 45-year-old. She now plans to have two more shops in nearby villages. Khairunnisa was a treasurer of a women's self help group (shg) in the area. 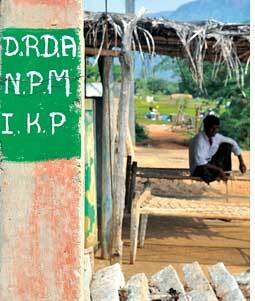 Many such groups operate in the districts and they train farmers to set up npm stores. Currently, there are 300 npm shops across the state. npm farming has benefited from the centrally administered National Rural Employment Guarantee Scheme (nregs) after the state government integrated the latter into npm. Labourers were paid from funds for rural employment scheme to dig farm ponds to irrigate npm fields. Ramachandrapuram in Khammam district was the first village to introduce employment guarantee scheme in fields under npm cultivation. The works taken up under the scheme included digging of farm ponds, making compost pits, land development and removing silt from dried water tanks and ponds that can be used for improving soil nutrients. Other villages like Punukula, Mulukallapalle and Vepakoyyaram-avaram, in Khammam, followed suit. G Subbalakshmi, a 40-year-old farmer from Chhinnarasupalli village of Chhinnamandem mandal had no irrigation facility till about seven months ago. She was cultivating dry land paddy and other crops that need very little water. After a farm pond was dug in her field under nregs, she sowed paddy on her 0.6-hectare plot. She stopped using pesticides. 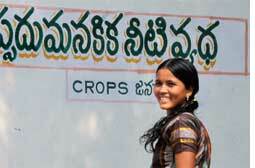 "From 10 bags of paddy last year, my yield may go up to 25 bags this year. I have also saved Rs 2,500 by not using pesticides," Subbalakshmi said. Now she is planning to take up pisciculture to augment her income. According to D V Raidu, the state project advisor for npm, digging farm ponds helped farmers irrigate their fields and recharge groundwater. "About 400 farm ponds were dug in Nizamabad district and as a result, groundwater levels rose by 4.5 metres in Ellareddy mandal," Raidu said. He added that work orders to the tune of Rs 6.76 crore had been executed and funds totalling Rs 2.44 crore had been disbursed. With npm making agriculture profitable, there is a noticeable decline in suicide deaths in the state. "There were no debt-related suicide deaths in any of the 3,000 npm villages in 2007," said G V Ramajaneyulu, executive director of Centre for Sustainable Agriculture, a non-profit spearheading the npm programme. Though there is no study to link decrease in farmers' distress with decline in suicide deaths, farmers said that debt drove many to consume pesticides readily available in all households. "Women constantly feared their husbands or sons would consume pesticides. But now, even if they want to, the only immediate choices are bio-pesticides made from cow dung and urine, which they won't drink," said Khairunnisa, the npm shop owner of Vattam village. The motive for discontinuing the use of pesticides may have been to cut cultivation costs, but farmers are realizing that their medical bills have gone down. Most farmers used to complain of giddiness, skin problems, breathlessness and burning sensation in the eyes while spraying pesticides. "Some even had to be admitted in hospitals for treatment," said P Lalitha of Chittapur village in Rangareddy district. Her family's health improved after use of pesticides was stopped. "Our visits to the hospital have ceased altogether," she said. 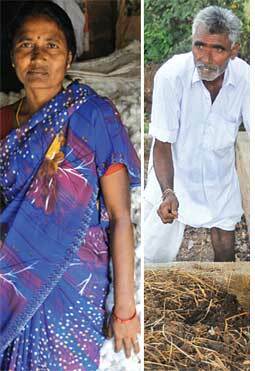 Lalitha earned Rs 30,000 from paddy and Rs 20,000 from vegetables in 2007. She no longer worries about the health of her family and has enrolled her children in good schools. Sixty-year-old Doodakule Ghousia, another resident of Chittapur village, said her husband used to complain of stomach problems, nausea and restlessness when pesticides were in use. "At times he would get fits during the spraying season. We had to go to the hospital every other day and each visit used to cost Rs 500. That has stopped now," Ghousia said. Official figures for Ramachandrapuram village say there were nine serious hospitalization cases due to spraying of pesticides between 1994 and 2003. There have been none since. The farmers of all the six districts Down To Earth visited--Warangal, Guntur, Mahabubnagar, Khammam, Kadapa and Rangareddy--said they are leading healthier lives after discontinuing the use of pesticides. So far, the npm programme has focused on making farming sustainable. Of late some attention is being given to marketing npm produce. Farmers of six villages in Guntur district have been able to tap the market by forming a farmer's co-operative society with the help of a local non-profit named Rakshana. Over 300 farmers owning about 240 ha of npm fields have joined the cooperative that will decide the prices of chillies, process products and sell them for profits. serp is currently discussing certification of npm products with the Ghaziabad-based National Centre of Organic Farming under a community participatory guarantee scheme that will help reduce the certification cost per farmer. Such certification will not help export npm produce, said T Sudhakar, assistant general manager of the Hyderabad branch of the Agricultural and Processed Food Products Export Development Authority (apeda). " Participatory guarantee scheme certification is sufficient for local consumption but it has not gained acceptance internationally," he said. Big Indian companies and multinationals that have entered the food retail market can help market npm and organic produce of farmers and also absorb their certification cost, he added. apeda is the accrediting agency and secretariat for all organic products. Raidu, however, said that the community certification scheme would be sufficient as the aim of the project is to make farming sustainable, produce chemical-free vegetables and making it locally available. He said that big companies would make farmers dependent on them and defeat the purpose. "I feel certification is not required. But we at serp do not mind such certification," he said. Once the certification procedure is streamlined and market linkages are established, it may not be long before npm vegetables, cereals and pulses will be easily available in all markets across the country.